As a child my favorite thing about decorating the Christmas tree was setting up the Nativity scene that went along with it. My mother always bought fresh moss from our local florist as a basis for our nativity figures. I remember fondly its fresh and earthy smell while we would set the figures. We didn’t have many characters but I treasured our nativity scene and at the end there was always one final touch. Trying to divert some of the Christmas tree lights towards the Nativity scene, just above Mary, Joseph and baby Jesus. The Nativity scene and the scent of cinnamon and sugar sprinkled over the “filhoses” (a typical Portuguese Christmas fried dough) are two of my fondest memories of my childhood Christmas. As an adult and living abroad, I acquired different international Nativity sets over time but nothing compares to my “Santons” obsession. 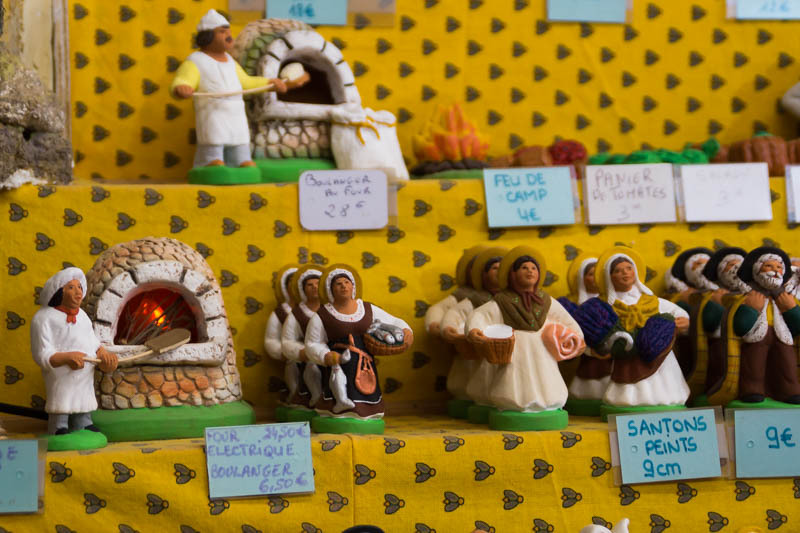 I had no idea what they were until I went to my first “Santons” fair in Switzerland some 15 years ago. The diversity of Nativity scenes displayed there enchanted me. Whole villages built, with hundreds of characters. Every profession represented, houses, farm animals, forests, snow landscapes, the possibilities were infinite. 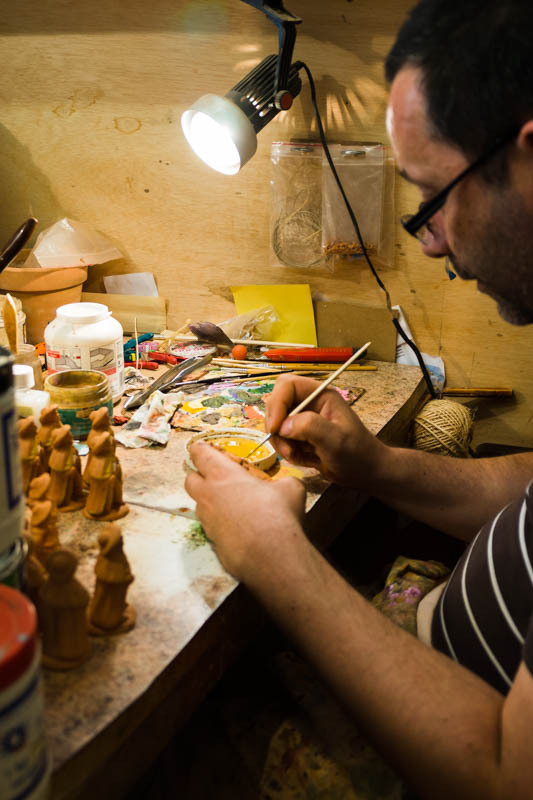 The skill of the artisans was exceptional and that is where I learned that the center of the “Santons” production is in France’s Provence region. And it all started with the French Revolution! In the aftermath, in 1789, churches were closed and became property of the state. The Church, the biggest landowner and sole responsible for the education and spiritual guidance of the people, lost its power. People could no longer go to church to celebrate Christmas and watch the Nativity scene. But they were very religious, so they started doing their own nativity figures at home with materials available to them like bread or paper. They did it secretly as it was forbidden and if caught they could face grave consequences. Soon each household had its own nativity scene. They usually had Mary, Joseph and baby Jesus. 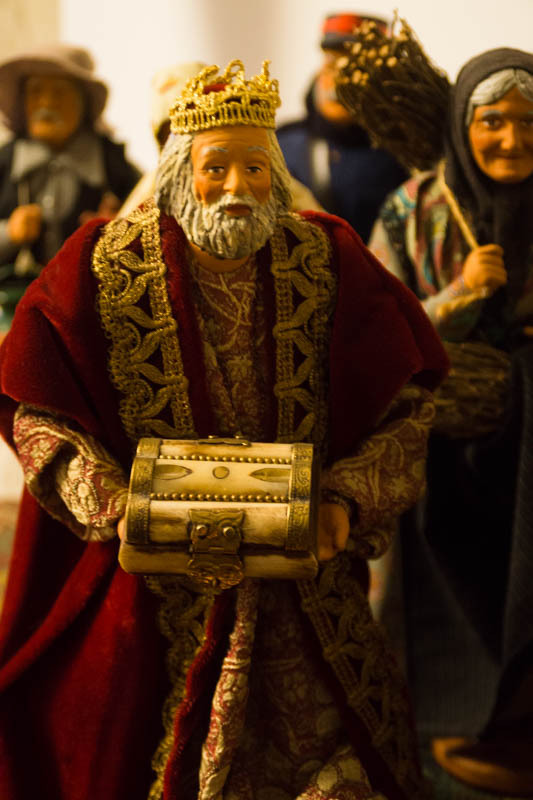 They called these figures little saints thus the origin of the name “santons”. The “Santonnier” profession appeared not long after, in 1798, when a man from Marseille was walking in the countryside in Aubagne, Provence, and noticed his shoes were covered in a wet, earthy substance that he could not get rid off easily. When he touched it, he felt how maleable it was and had the idea of using it to create a nativity scene. 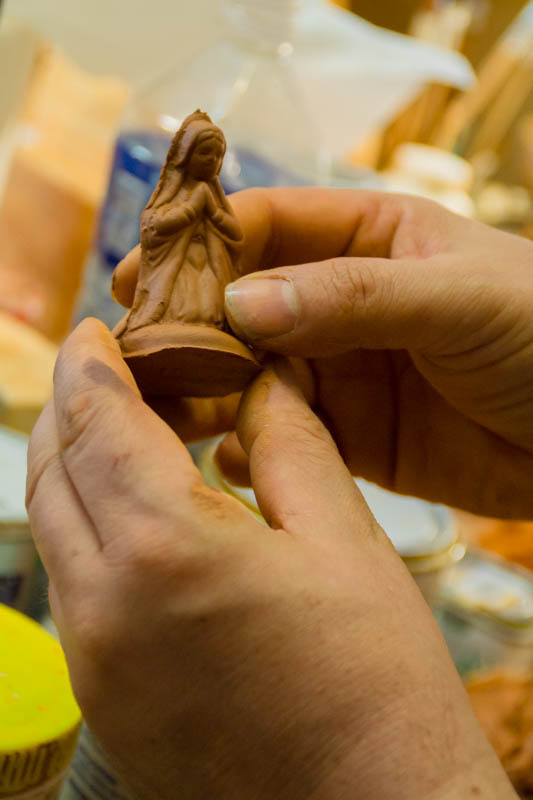 He quickly sold it and that is how clay Nativity scenes and the “Santonnier” artisan was born. Needless to say I wanted to buy everything at my first “Santons” fair but I would need a Palace to set out all those Nativity scenes. 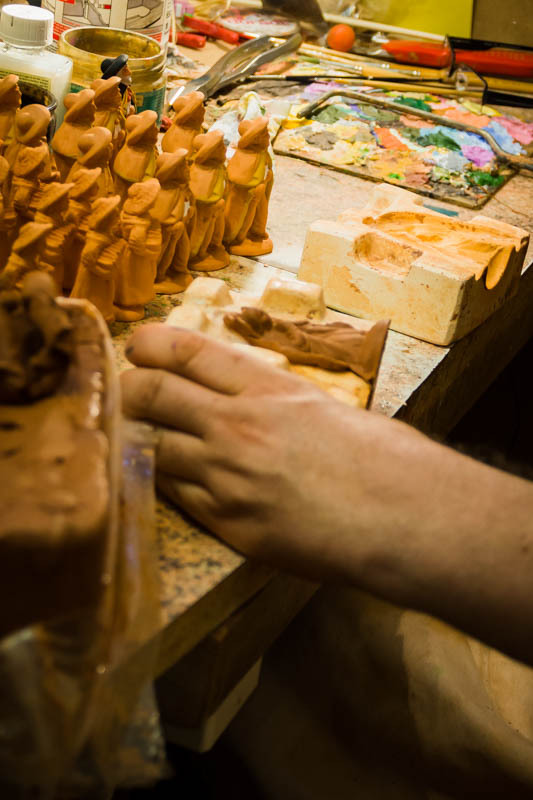 The smallest sized clay figures are skillfully painted by hand and the biggest sized clay figures are painted by hand but they are clothed as well. I confess I could not resist these last ones. I can only imagine the work involved to make the wonderful clothes to size and even undergarments as well as other accessories. 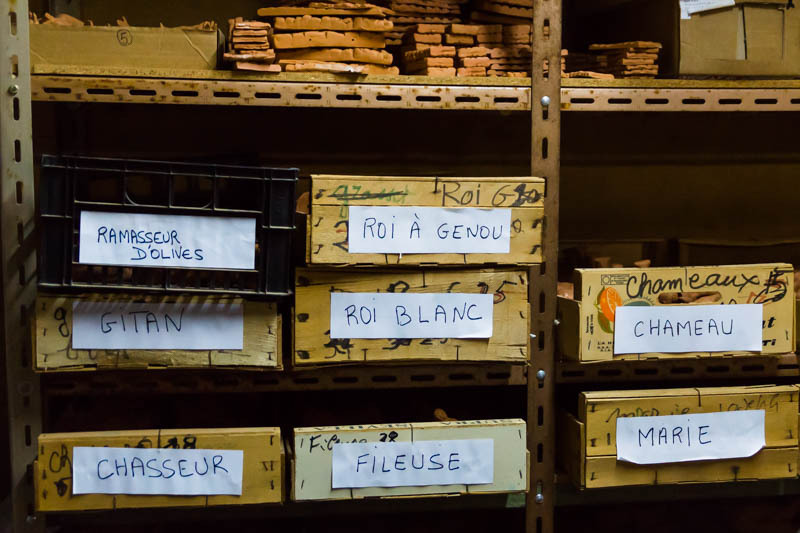 My collection started in Switzerland but then I managed to increase it by visiting a few producers in Provence as well. But there is a disadvantage of course, their big size requires a lot of space so most people understandably go for the smallest “Santons”. 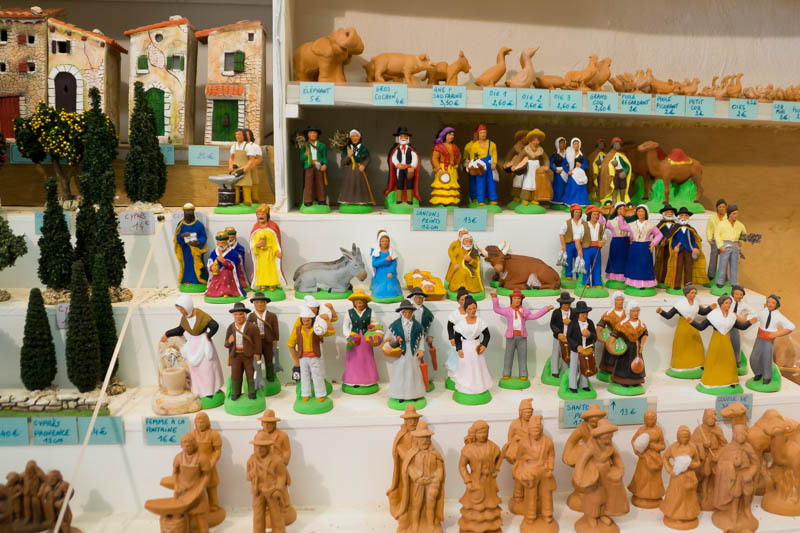 That is why this summer on my big road trip, I decided to visit a traditional “Santonier” or artisan specialized in the small sized “Santons” while in Provence. I contacted M. Campagna in the breathtaking village of Baux de Provence. He agreed to receive me in his workshop/shop to show me his skill as a “santonnier” in his family enterprise that began with his grandparents in 1943. I was greeted with a smile and luck would have it M. Campagna had just started to paint a few pieces. We could observe his skill and precision. He explained how you always started by painting the inner layers and then move to the outer layers to avoid mistakes. If a mistake does occur, you can only correct it if it is a light color, if not, you need to start over. He showed me the clay he uses in the creation of his Nativity pieces. A special mixture he has to order from another region as unfortunately, there is hardly any clay left in Provence. The “Santonnier” work is still very traditional. 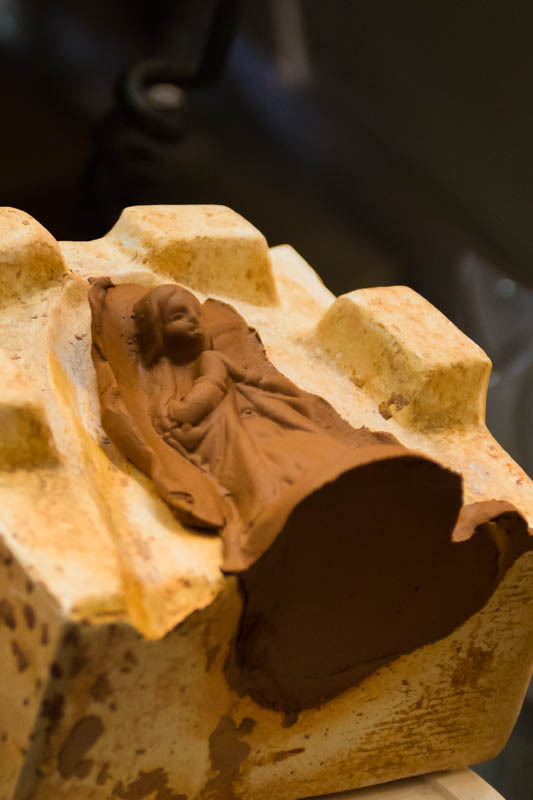 He creates his piece in clay and makes a Paris plaster mould of it. Then a production mould is made which will allows him to produce a small amount of that particular figure. Every year M. Campagna creates at least one new nativity figure. So if you bought a Nativity scene you could add a newly created character every year. What I also love is that each character has its own particular facial expression. I can only admire the skillful hands of the “Santonnier” and the patience and finesse needed particularly for the smallest “santons”. M. Campagna also explained that sometimes when one of his clients breaks a piece and comes to replace it, he cannot guarantee that it will look the same. Each piece is really unique. And this is how it works. The “Santonnier” prepares the mould. He puts clay on both sides of the mould, shuts it tight, takes the excess out and lets it dry a bit. When the mould is open, the figure will be removed carefully. The “Santonier” then makes the final retouches until he is happy with his creation. He will let the piece dry for as long as possible. Sometimes a few days or more pass until he has enough pieces to fill the oven. 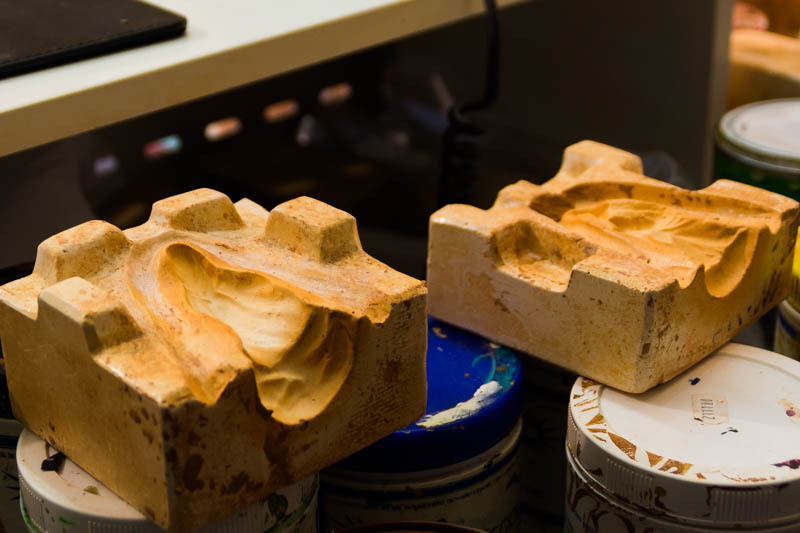 The pieces will then be baked at a temperature of 980º/1796º F. A few days later they will be ready to paint. 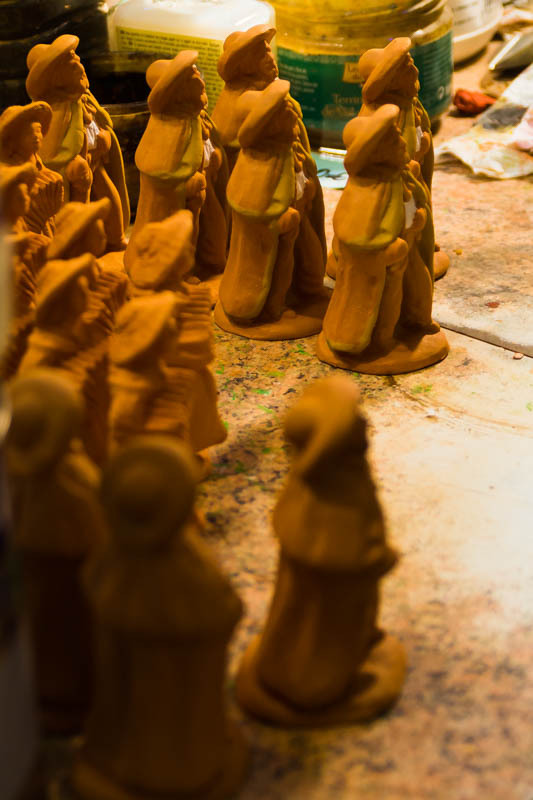 The water and gum paint dries quickly so often the “santons” are put to dry already in the shop. From September to January M. Campagna does the moulds and figures. 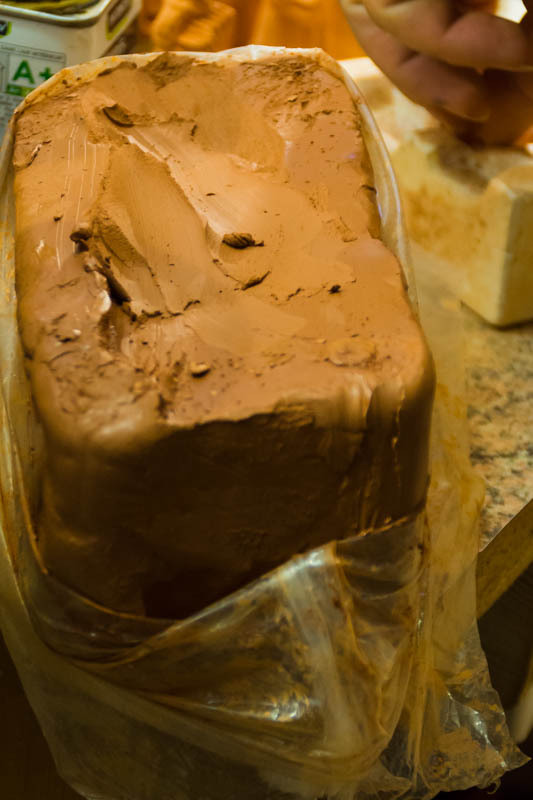 The moulds can’t be done in summer since the heat would dry the clay too fast and make it impossible to mould. Spring and summer are therefore used to paint the figures. It was nice to see the different types of mould, some inherited from his grandparents and parents. And to see where he keeps his little collections of the different characters . After learning so much about this traditional art that is sill being maintained by skillful artisans like M. Campagna and others, it was time to explore his shop. And again I felt like I could have taken a bit of everything home. This is just a small sample of what we saw. But in view of the fact that our four week long road trip had barely started and that there were a lot more things to discover on the way, I held myself back. And of course I should also mention my husband who is always trying to prevent me from buying anything, to no avail I should add! I had to buy a few pieces for Christmas after all. Some pieces are left unpainted because there are people who like to be creative and do it themselves. 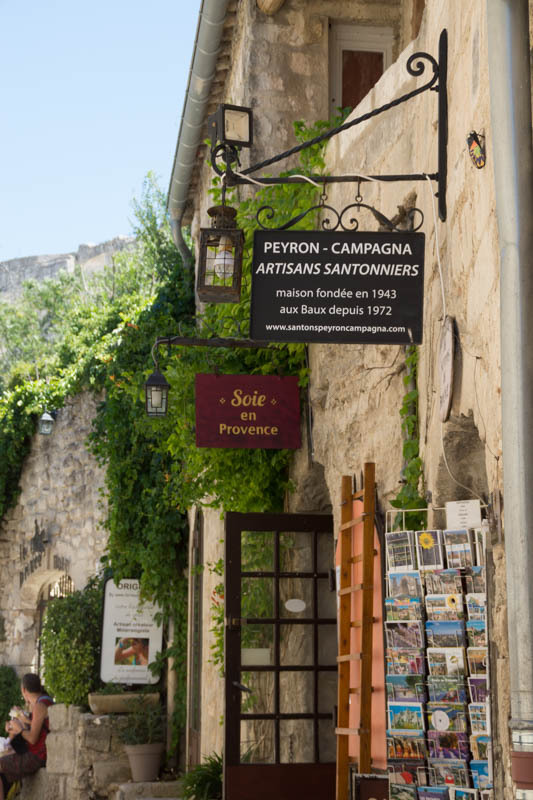 I felt happy we had taken the time to learn more about the art of Provence’s “Santonniers”. Even more because I could show my 5 year old daughter the tradition and story behind the Nativity scene. I’m a firm believer that we should pass our traditions to our children to keep them alive. So if you are ever in Provence take some time to visit one of these special artisans, support them, so that their work can be kept alive. 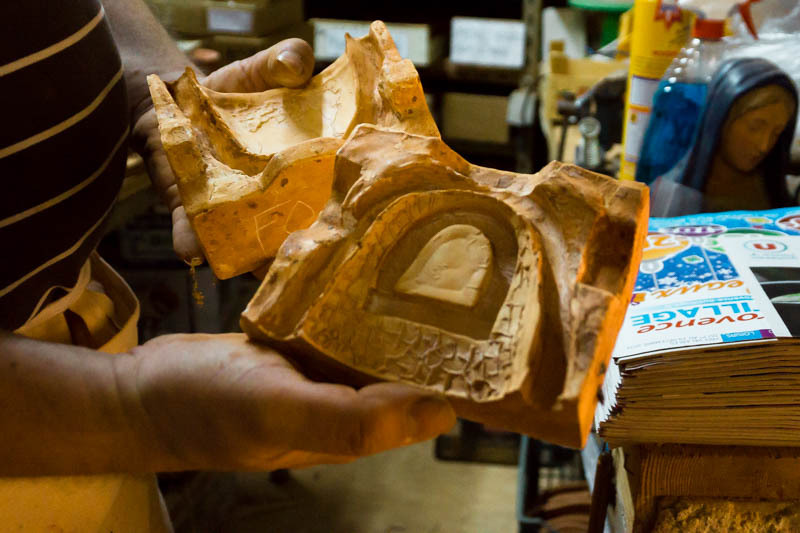 Every “santonnier” signs his work at the bottom of each piece he creates, so always check for the seal with his name. M. Campagna told me he has faithful clients, some from his parents time that continue to buy from him and now their children too. It passes from generation to generation. It was also nice to learn that his daughter is already helping him and will hopefully one day take over this already 3rd generation family enterprise. Baux de Provence is a beautiful village with much to explore and M. Campagna will be happy to welcome you and show you around his workshop. 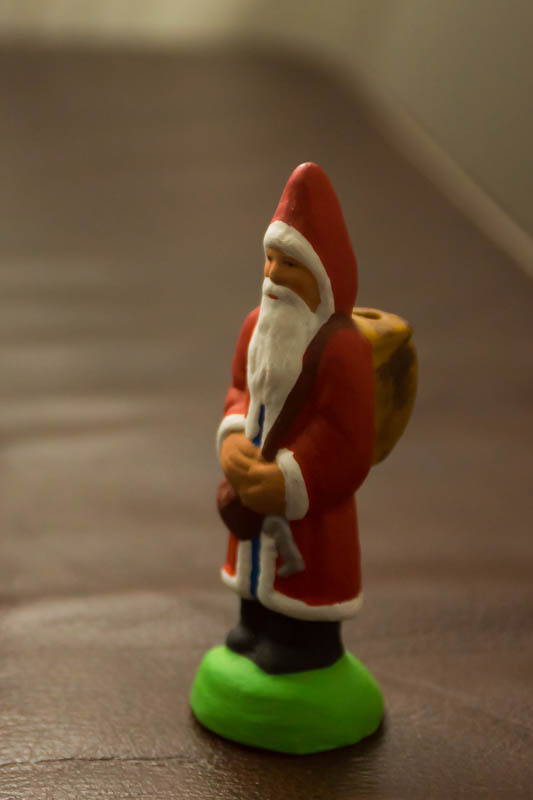 I leave you with Santa, chosen by my daughter, another “Santon” that will witness our Christmas celebrations.